"A good folk song is easy to learn and hard to forget. Its melody is brief, its chorus repeats, its rhymes lead from line to line like the base pairs in a chain of DNA. A folk song is a meme, an evolutionary biologist might say--–the cultural version of a gene. It passes from generation to generation, evolving as it goes, till every clumsy or extraeous line is stripped away....You only have to hear it a few times to know it by heart"
The Last Verse: Is there any folk music still out there? I cracked open the New Yorker last night (it promised to be good with a cute illustration by William Steig on the cover (see left) to find this wonderful article which I am chugging my way through about folk music, it's origins, John and Alan Lomax, and it's migration to the current day. The current Old Time music as defined by the musicians I know is a definite descendant of this tradition--albeit one step away as some of it is interpreted with a new twist--or maybe it is as grandchildren are different from their grandparents but carry the same genes but different histories. I am thrilled with this piece as it is rich and a primer on how this american tradition got from here to there and some of the personalities and people studded in the mix. The Lomax father and son were predecessors of Peter Hoover(who is a Tburger and Godfather to many of the musicians here on our little plateau) and group of field recorders in the Lomax spirit, the men who went into the hollers of Virginia, West Virginia and other parts south in the mid fifties and sixties to record musicians and their music. These closets of recordings are now being opened and pressed into CDs now that it is cheap and easy to do so--and you can get snippets and buy collections from their site>>. Now how does this tie us closer and closer to our local music. Well, because even some of the newer recordings being pressed are recordings made in the eighties by none other than the Chicken Chokers. And now, the Chokers are new and revived--so the energy is around moving the music and attracting old and new friends. Thus, my interest as it is what is old is made new. The clothes of the ancestors worn by the children with great style and panache without forgetting aspects of the past but styled to be "now". I guess this is the context of the americana illustrations I would like to work on for my dream project for my first week at the University of Hartford's MFA illustration contact period in July. 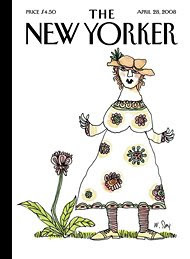 As an aside, Mr. Bilger, the author has written on spiritualism, Lilydale and all sorts of other terrific and quirky things (I searched him on the New Yorker site). I think he is a kindred spirit. I need to read more of his stuff.